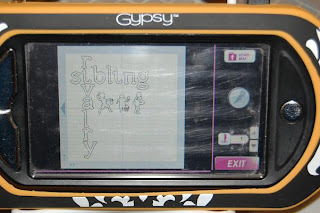 Here is an example of why I always use my Gypsy with my Cricut ~ even if I am not welding or designing something intricate. 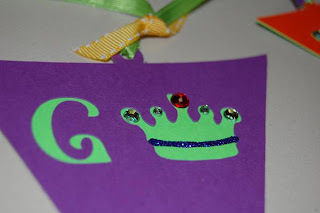 I love being able to place letters and shapes on my mat where I want them to appear on my scrapbook page. I was inspired by a layout in this month's Scrapbook Etc. 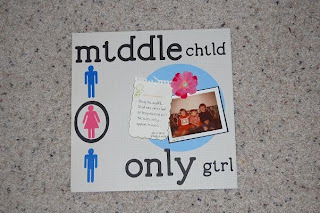 magazine about birth order. 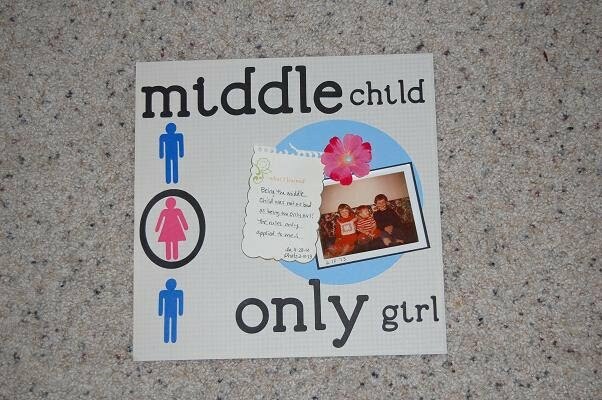 I decided to do this simple layout of my birth order as well as my only girl status. 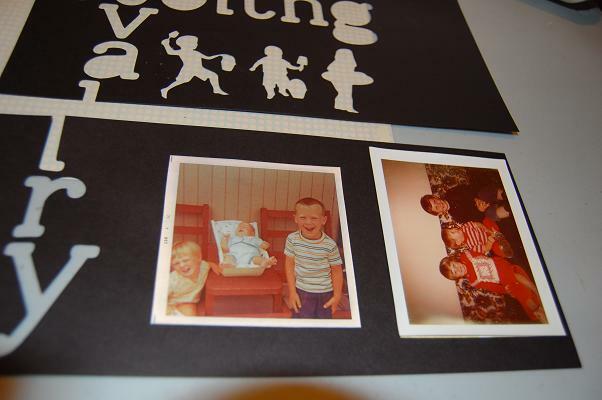 I could not find a photo of us the the proper order (me in the middle) but this one does have all three of us! I used Lyrical Letters for this font and for the oval frame. 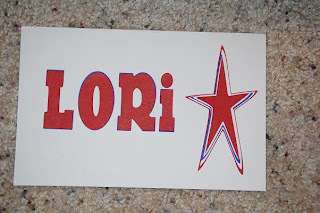 I love that the dot is connected to the "i" because I am constantly losing those little dots! I used Going Places for the people. I needed a page to go opposite this one in my scrapbook (my only scrapbook obsession) so I came up with Sibling Rivalry. I love this photo because my mom asked my brother and I to watch the baby (the brother who later tormented me on a daily basis) while she picked some tomatoes in the garden. Well, we watched him alright ~ watched him wiggle and flip himself off the table and onto the chair. There were no cushions on the chair either. Don't worry, he was strapped into his seat and was fine, just a bit unhappy!! I wanted to do the title as a crossword puzzle. 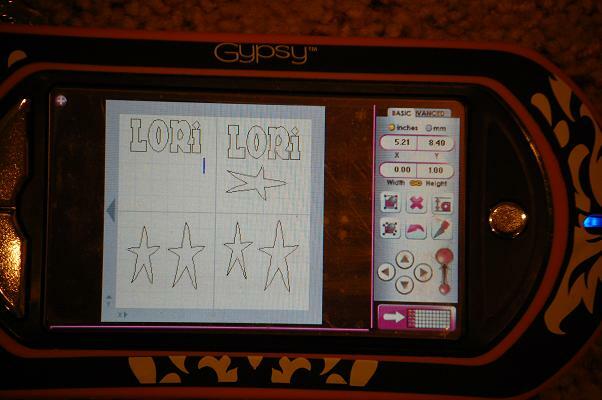 I used Lyrical Letters again and lined them up on my gypsy using the x coordinates. 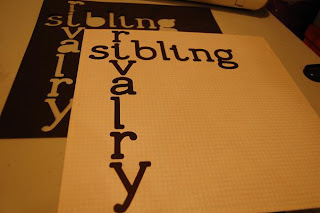 I frst put the word "sibling" using 2 inch letters on the mat and then checked the x coordinate for the first "i". It was 1.60. I lined up the letters for "rivalry" using 1.60 as the x coordinate. I did adjust the "v" and the "y" because they looked a bit off to me. I grabbed the beach children from A Child's Year because we spent so much time on the beach at our cabin. We were actually getting ready to go to the cabin here. I moved the children up so I would have a good chunk of paper left as a scrap. 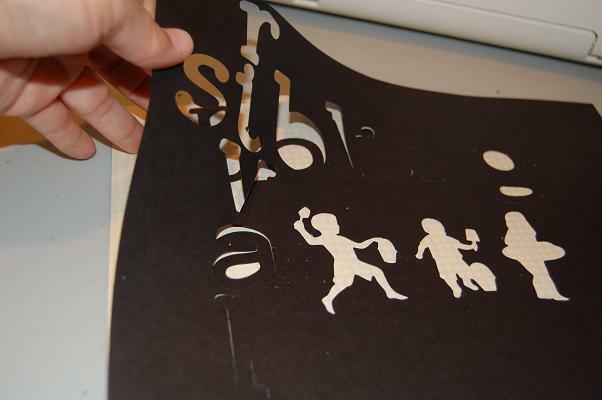 I cut out the page in black paper. I then paperclipped the negative to my background paper. I ran the letters through my 5" Xyron and stuck them on the page using the negative as my template. I pulled up the negative. And presto.....the page is perfectly aligned!! 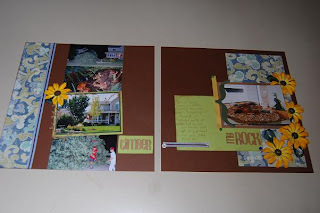 I used the scrap paper to mat my photos for both layouts. 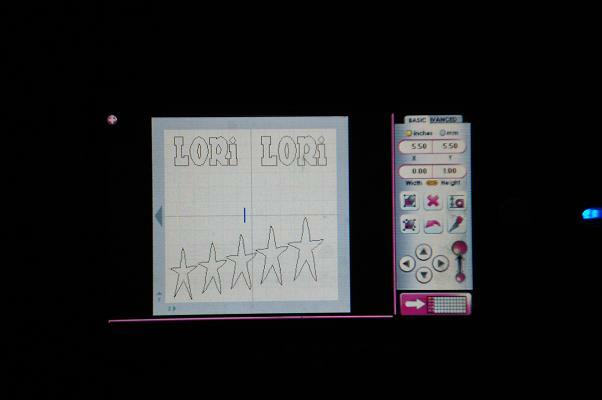 For both layouts, I cut out a circle at 7.05w x 6.58h to use as a background. I also added journaling. 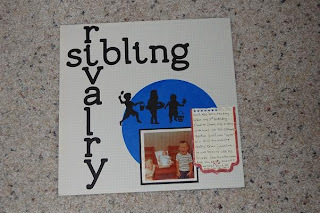 I am slowly but surely working on my very own scrapbook all about ME for the first time since I started scrapbooking 13 years ago. Why do we do so much for others and not for ourselves? 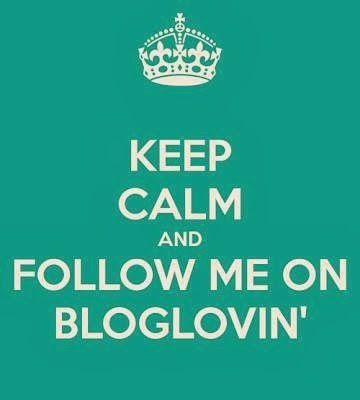 That would be a whole separate blog post LOL!! I found these photos of my mom taken in 1987 when she was in remission from lymphoma. Her cancer came back in December of 1988 and she passed away in March of 1989. She was given a bit more time with us and mom and dad took advantage by taking several trips. This layout is loosely based off of the LID challenge from the week of April 23rd. I did not finish it in time to submit it. 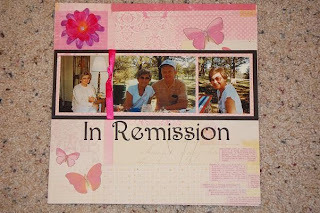 I did not add many details as I really did not want to take away from the photos. This is not how my mom normally looked. Here she has on a wig and she looks so fragile ~ but her smile brings her whole body to life! I used this paper from a K&co pad because she loved butterflies. 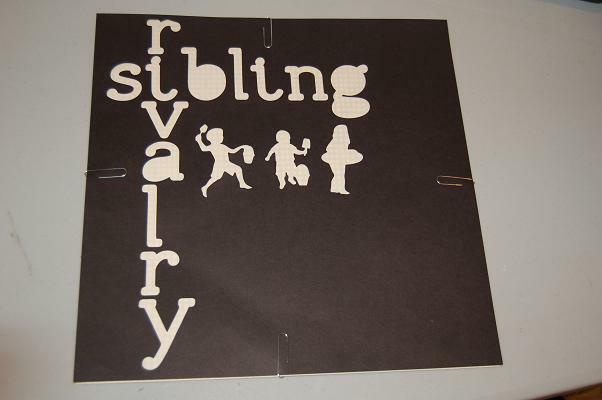 I used my new cartridge Nursery Rhyme for the font. 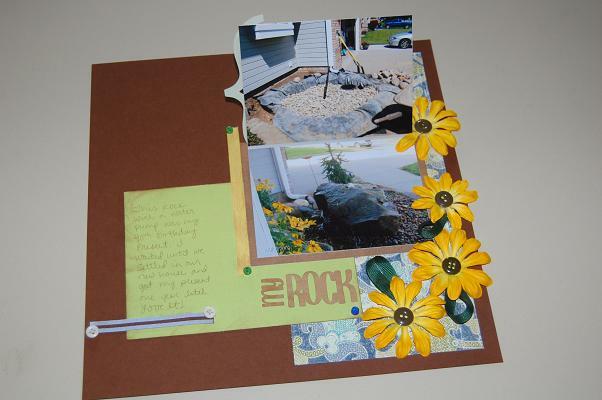 The second layout is also from the LID challenge. This is a photo of my parents on a cruise after mom's hair grew back and she gained some weight back (she looks less fragile here). They both look so happy here ~ I just love her smile!! I used Home Decor for the hearts and swirls. One of the recent Gypsy challenges was to mirror and weld images. I put one heart on the mat, copied it and flipped it so it would mirror the first one. I grouped them together and copied another set of hearts and flipped them. I welded them all together to make this embellishment. The swirls were done in a similar way. The swirl is also from Home Decor. I copied and flipped a swirl. I then grouped the two together and copied again. This time I rotated the second set of swirls to 90.00 and welded the corners together. 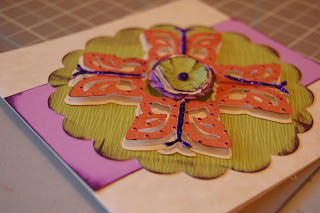 I cut out a circle from the same paper and used the reverse side with the butterflies. I inked the edge of the circle in black chalk, added a little ribbon and a flower to match the other page. I just realized that I have lived half of my life without her. 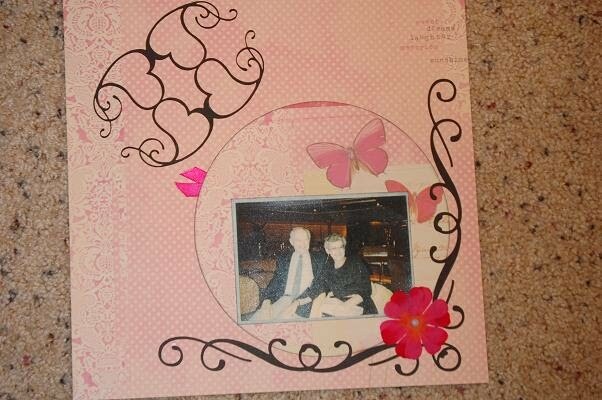 She was a very crafty lady and I am glad that the apple did not fall far from the tree!! Happy Mother's Day (a little early) Mom! 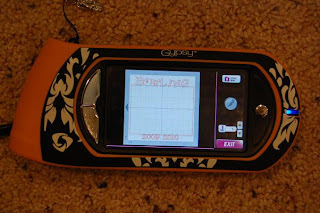 On the Gypsy ChitChat forum of the Cricut message board, we have weekly challenges. These challenges are great because part of the challenge is to use a specific feature of the gypsy. So we are learning and creating!! This challenge is to use the Real Dial button on the Main Menu page. It is a box with the letter "a" and an up & down arrow in it. Real dial is a weird concept to grasp at first. 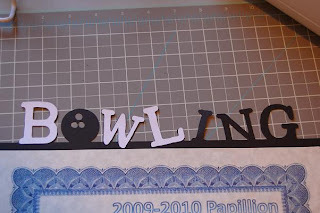 When you select a size for your shapes or letters, not everything will cut at that exact size. 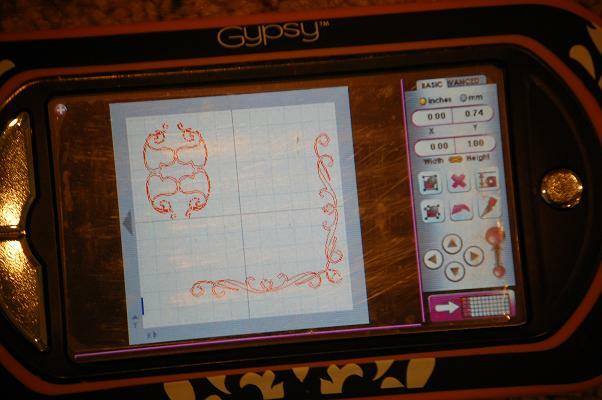 For example, if you select 2" height for the word Love using the Gypsy Font, only the "L" is actually 2" tall. The "o v e" are less than 1" tall. Another example of this is when you are working with paper dolls or a Disney character. You select your size (let's say 3 inches) and that size will be the shadow of the character. All of the other pieces will be cut at 3 inches as well, but they will be the correct size to fit the 3 inch character. You don't want 3 inch eyeballs for a 3 inch Mickey Mouse!! Every now and then, we do want a specific size of a letter or piece of a character or layered item. 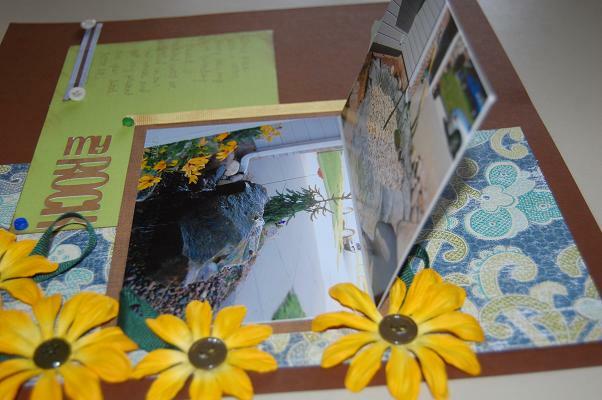 We sometimes use pieces to make cards or designs by welding them with other pieces. 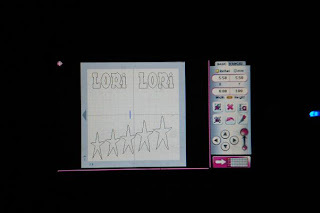 In this case, by selecting the Real Dial Size button the letter or shape you select will be that exact size. If you want a 7" lower case "e" you can get one much quicker by using the Real Dial button. For some fonts, the shadow feature is not an option, so this is a way to make a shadow. I selected Don Juan because it does not have a shadow option. I put my name on the mat and sized it to 2.0 ht with the Real Dial button on (yellow). I grouped and copied my name onto the mat. I ungrouped and moved the letter L over my first letter L. I then unlinked the chain so I could adjust the height and width separately until I found a good shadow. I repeated this with the remaining letters. Then I took the star and made a total of 5 stars, each one a bit bigger than the one before it. I arranged them on my mat to cut out by color and cut. 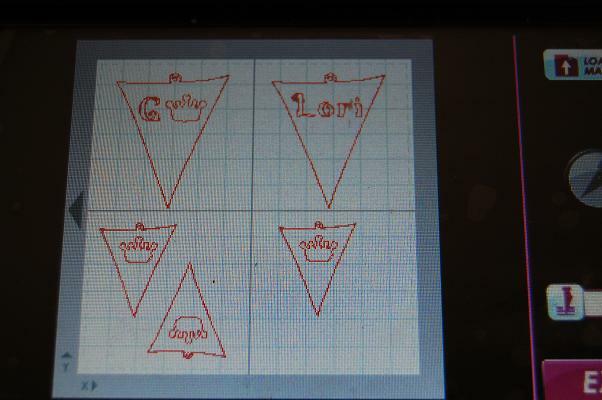 This was "Real" educational and a bit frustrating to get just the right size on the shadow layers. Depending on the shape or letter, you could only go so much taller or wider to keep things proportionate! It is very much a trial and error process. I have been waiting for the perfect artwork to hang above my bed for a while. I have HGTV on while I scrap and blog and I have seen so many awesome ideas, but have never found exactly what I wanted from a store ~ until now! I found 3 wall frames at Michaels 40% off and snapped them up. They are a close match to the color of my headboard and mimic the shape and size of the design. I originally wanted to put a black and white head shot of each of my boys as an infant in them, but changed my mind after looking around the rest of my house. Their beautiful faces are plastered everywhere!! I finally got the Home Decor cricut cartridge a couple of months ago and found some twigs and vines that looked very similar to the pattern on my bedspread. So I used cardstock in colors to match the bedspread to cut these out. I made a 8x10 rectangle on my gypsy to use as a template. 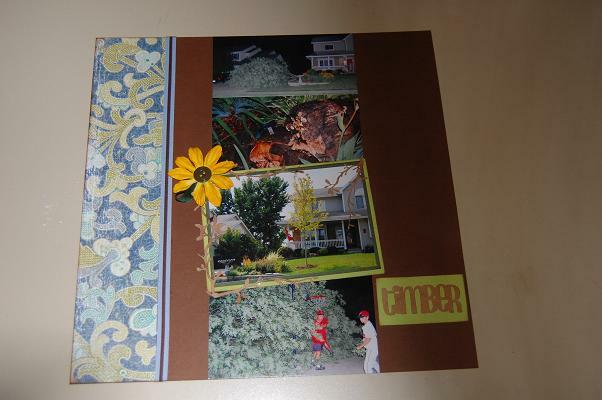 On pages 2,3,&4 I added one of the branches and sized it to fit inside the template. I cut them out and put them in the frames. I hung one frame on the nail that was already centered over the bed. I wasn't sure if the picture was too high or not. I liked it more every time I saw it, so I added the others. 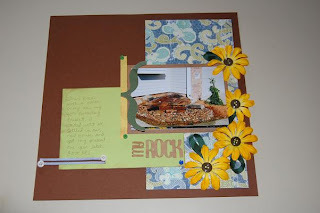 Let me know what you think and what Wall Decor you have made with your scrapbooking supplies! This layout is from a sketch on the Practical Scrappers blog. When I was 3, I fell in our garage and hit my mouth on the cement step going into the house. I knocked my front tooth very loose. I went to the dentist the next day and had it pulled. I had a gap in my mouth for years!! I wanted to capture the story and originally thought I would use a large tooth shape as a background for my photo. Well, it just did not look right because the tooth needed to be white and the colors didn't look good. I also changed the photo a couple of times, finally picking this one because I liked the dress ~ more important it goes with the paper I chose (he he). I started by putting a square on my gypsy mat the same size as my photo. It is an odd size ~ 3.75 x 3.75. 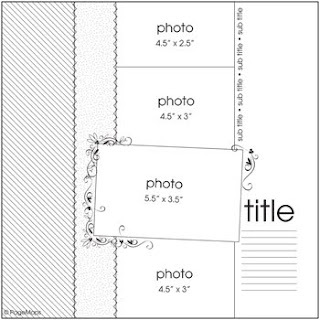 Then I took a scallop square from Accent Essentials and sized it to mat my photo (4.5 x 4.5). This was the paper that I HAD to use!! Then I grabbed the letters from Ashlyn's Alphabet and the tooth from A Child's Year. Using the 12 x 12 mat as my guide, I sized the letters and tooth so the title would fit where I wanted it on my page. Finally, I made a corner by using a heart swirl from Mother's Day, copied it and rotated it -90 degrees. I anchored the swirl with a heart from Home Decor. I positioned the three pieces together and welded them. 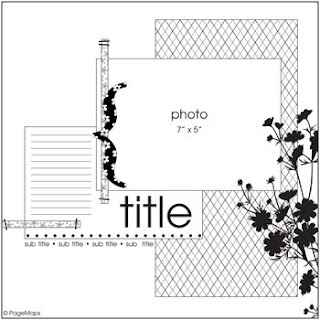 I them moved the corner piece to the scalloped frame and sized it. I arranged the pieces on my screen in quadrants by color of paper I wanted to use. I deleted the square that represented my photo and cut my paper. I originally thought I would use paper, but I used ribbon as a background for my photo because that is what I had on hand (in other words Practical). I made a LOVE card in February and saved the file. I am a packrat so I save almost everything, but I am really glad I saved this one!! I added a page and sized the numbers 2010 to fit the rectangles. 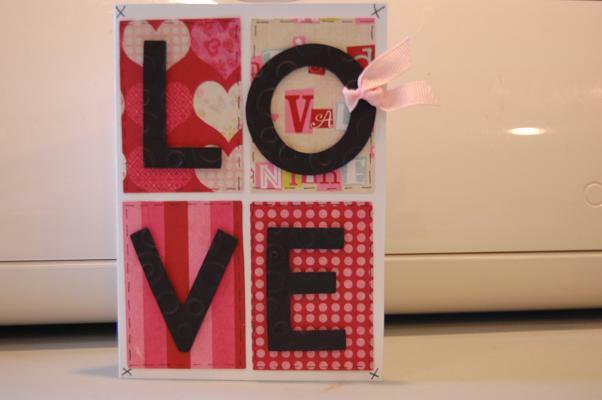 I saved the file with the numbers THEN I deleted the letters LOVE and cut out all of the pieces. When I was finished, I did not save the last changes so the LOVE is still in the file. I cut out the card in my friend's high school colors. 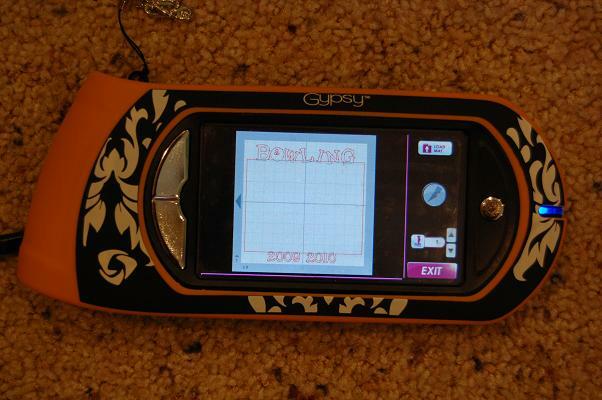 I embossed the rectangles with the nuumber folder on my cuttlebug. 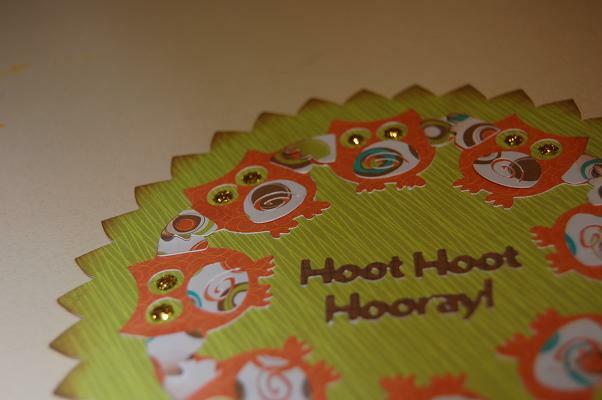 I used pop dots to assemble the card for depth. I added some gold gems and ribbon. I used Base Camp for the letters. 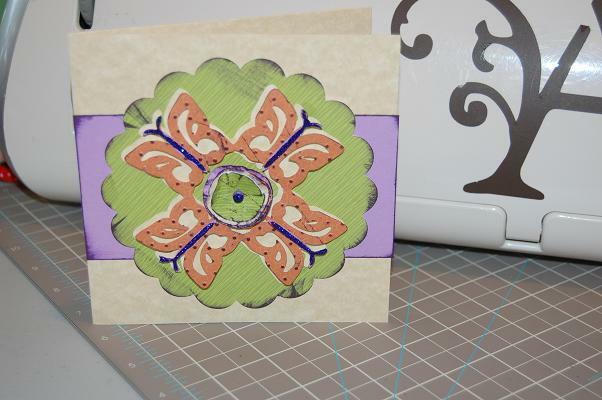 This is the circle project I designed on my Gypsy for the first Gypsy Challenge, but my cart would not link so I had to send it back. It took a while to get my label no thanks to my magical "spam" folder I did not know I had. I finally got my replaced cart and cut out my project. I inked the edges with brown stamp pad ink and used gold stickles for the eyes. 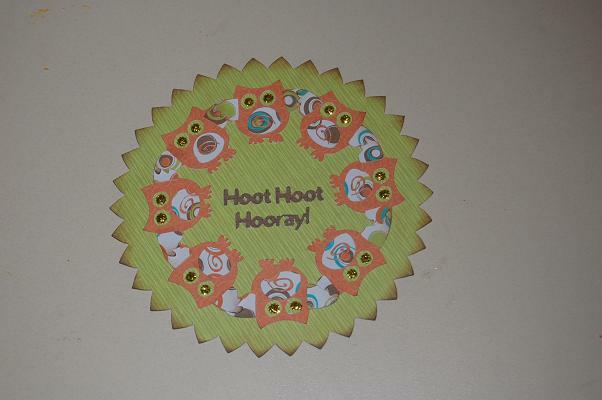 I am now sure if I will use this on a card or in a layout ~ I just loved the owls in a circle like cheerleaders!! 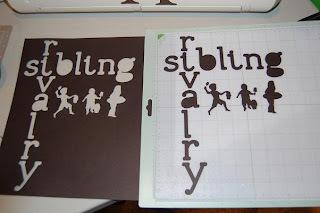 I made 2 different projects for the Gypsy Swap. This is a swap where we will share gypsy files. The projects are limited to Gypsy Font and Gypsy Wandering only. I used pop dots to adhere the butterflies to their base to give them dimension. I also used the same stickles on top of the brad that held the flowers together. 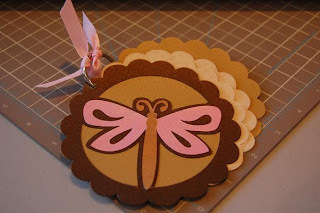 My second project is a Mini Dragonfly Book. I welded the dragonfly to the scallop frame. 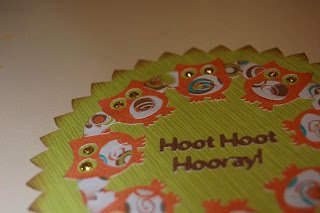 I used metallic cardstock that I found at Michaels. I used gold for the cover and back, dark brown for the dragonfly and scallop frame, white for the wings and body and gold for the spine. I used a tan cardstock for the inside pages. I used alcohol ink to make my own glimmer spray with Cranberry from Tim Holtz. 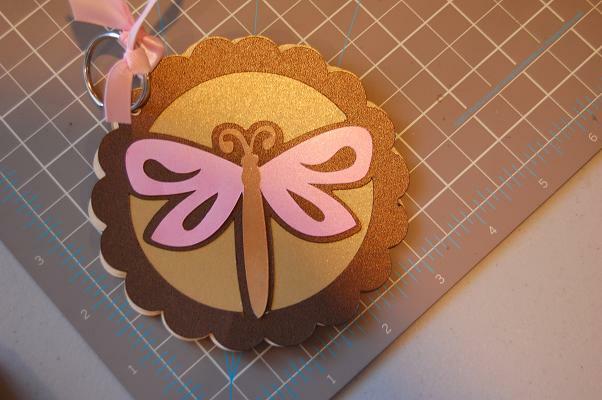 I sprayed the wings and body, turning the wings pink and making the gold darker than the background. 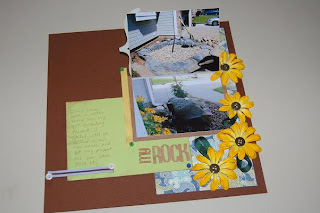 I used my Crop-A-Dile to punch through the pages and a binder ring to hold it together. Cute and Some Deisgner Showcase!! 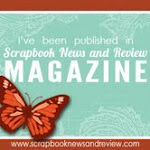 My friend Audrey Frelix is having a Designer Showcase each week on her blog. I am one of her Team Fairies ~ I get to select my favorite project each week and that desiger will receive an award for her blog! Consider entering some of your work! Showcases are held every consecutive Monday at Audrey's blog Cute and Some. Click HERE for the link! You may begin signing up with Mr. Linky to be a participant on the Monday and up until 8 p.m. EST on the Friday before the Monday of the showcase. No projects will be accepted after that time. 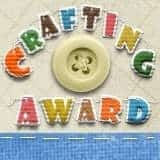 The purpose of these showcases is to feature your projects to be seen by others, and to reward you for your contribution and participation with visable recognition for your work(s); to offer support, and to inspire other crafters. THIS IS NOT A CHALLENGE OR A CONTEST! But, again, an avenue to have your projects shown outside your blog. Here are the sketches from the LID (Lay It Down) challenge from the Cricut Messageboard. I created this 2-page layout that highlights our front yard landscaping projects from last summer. We lost a tree during a storm and I finally got my birthday present installed ~ a drilled rock! The Timber layout shows the fallen tree and the clean up. We came home from Tyler's baseball game and dinner out with friends to find our tree had blown over in the storm. Luckily it did not blow into the house or on our neighbor's car! I used Don Juan for the font on both pages. 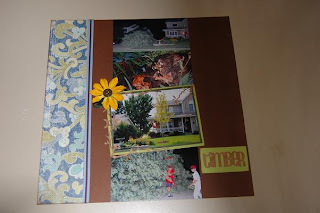 The tree branch border around the photo of our replacement tree is from Home Decor. 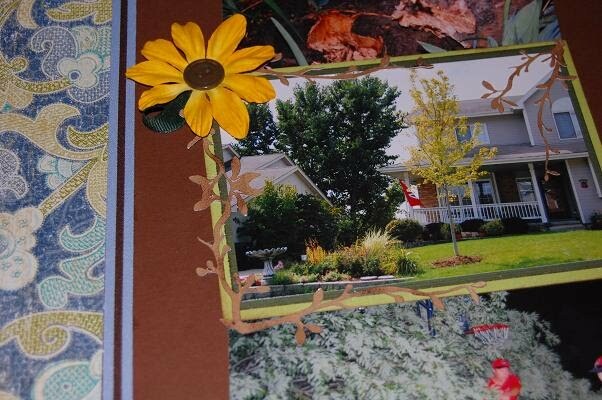 I added the flower to help tie the two layouts together. For Sketch #2, I made a hidden spot for extra photos. 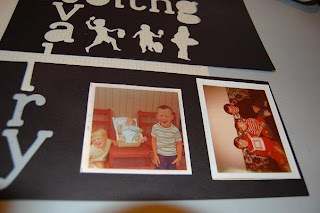 I didn't really need the photos to tell the story, I just wanted to keep them together. 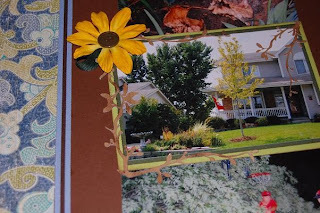 I used the yellow flowers with brown buttons in the corner to resemble the black-eyed susans that I planted beheind the rock. 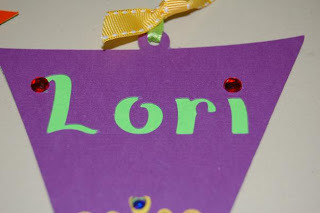 This week's Gypsy Challenge is to use the Kerning feature in a project. The Kern button is on the Advanced Menu at the top K_E. The Kern feature will move items closer or farther away from each other. This is an easy way to "squish" items together for welding. We are to create two sets of kerned images, one set double the distance of the other. 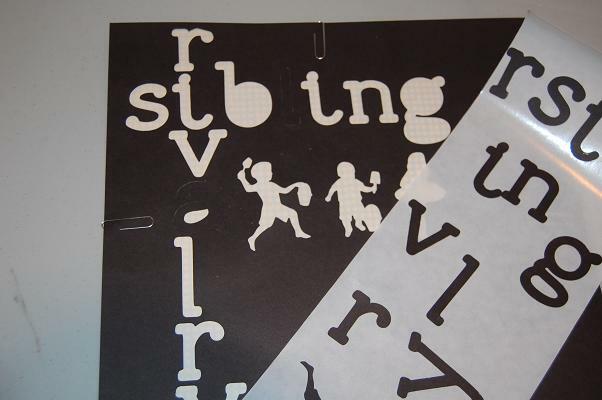 For my project, I used the Kerning feature to move my items away from each other. I wanted to celebrate my self-appointed Gypsy Queen status after winning the contest at Michaels for selling the most Gypsys company-wide in March. Now, I usually don't draw unnecessary attention to myself but I am extremely proud of this because I have helped so many lovely ladies learn how to use their Gypsies. I made a banner with flags from Lyrical Letters. I sized 2 at 4.36w x 2.68h and three at 2.82w x 1.74h. Inside one of the large flags, I added a G from Ashlyn's Alphabet and a crown from Gyspy Wanderings. 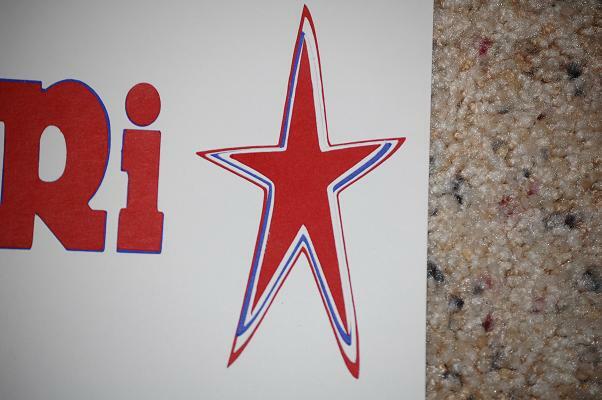 I kerned them .20 Next, I added my name from Ashlyn's Alphabet to the other large flag and kerned them .10. 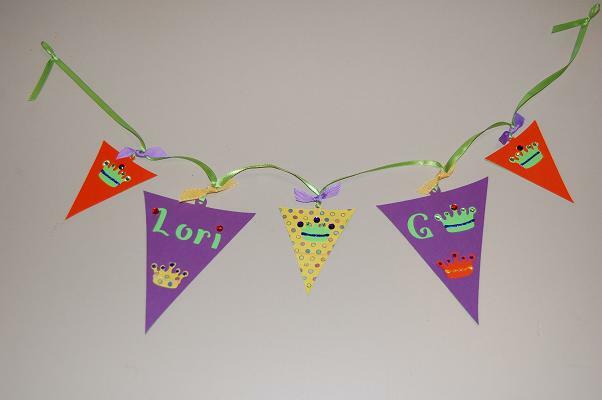 I added the same crown to the small flags. Hint: size one flag and center the crown in it, then duplicate it twice. The duplicate button is on the Advanced menu next to the eye button ~ it has two squares that overlap a corner. I cut out a second set of flags without any cutouts to use behind my first set. I cut this layer out in lime green. 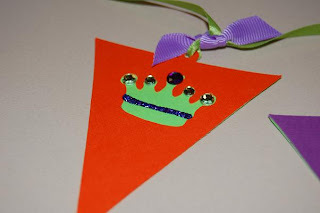 I used purple and orange for my coutout flags. These are the colors of my scrap nook!! I tied the flags together with ribbon to create my banner. I embellished with crystals and stickles. I am a self-appointed Gypsy Queen. I work very part-time at Michaels. I average 7 hours a week and three of those hours are before the store opens on Sundays. 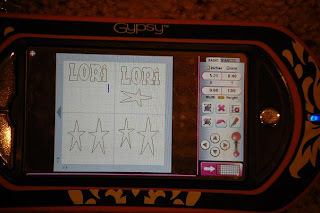 I offer free interactive demos for the Cricut and Gypsy 2-4 times a month. Our district does not offer classes right now, so this is my compromise. It gives people a chance to try before they buy! I have about 20 lovely ladies who have attended at least one of my demos and have learned a ton about their Cricuts and Gypsys. I also have enabled several to purchase a Gypsy. I do not get commission, just the satisfaction of helping people learn how to use these wonderful toys!! In March, Michaels held a competition to see which district sold the most Gypsys during the month. Not only did our district win, but my store sold the most!! Translation ~ I sold more Gypsys than any other Michaels in the US and Canada!!! I am proud to say that most of these purchasers have come to my demos and have learned how to use them too!!! Soooo, I have decided to appoint myself a Gypsy Queen. I have changed my name tag at work accordingly. 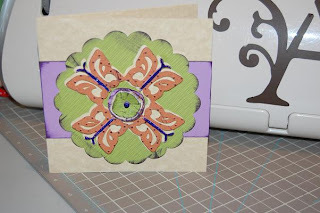 I am also making my Gypsy Challenge project this week in honor of my new title (which I will post tomorrow). MyaMagoo gave me this awesome crown to wear!! 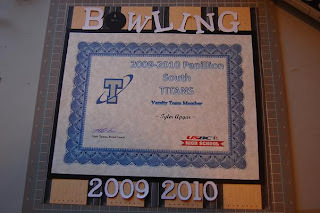 My son is a freshman and lettered in Bowling. He is not interested in a letterman's jacket at this time, so I am scrappin' it!! He also received a certificate from his coach. 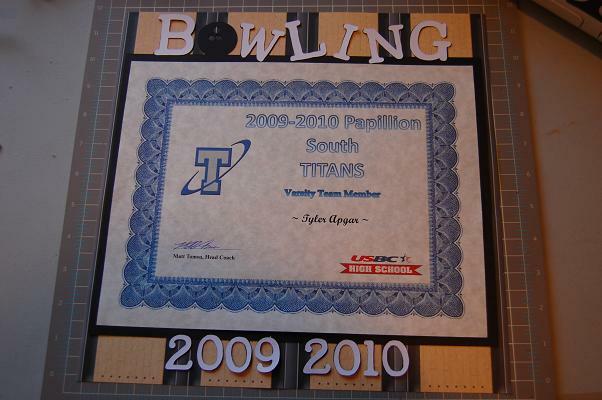 I wasn't sure how I wanted to put it together because the certificate is so big. I decided to create a back drop for the certificate. I welded the square from George to the letters and numbers from Doodletype. I used a cicle from George for the letter "O" and made three smaller circle finger holes in it. I cut out the letters and numbers in white. Sometims I weld the shadow of the letter to the shape then cut out the letters normal, but this time I wanted to cover the black background entirely. I used paper I found at Archivers. My nearest Archivers is about a 25 minute drive and I only get there a couple of times a year.